Who is Yue the Judge? And why is Ms. Mizuki in Sakura's dreams? Sakura might be close to capturing all the cards, but the adventure is far from over. 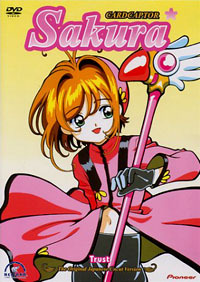 The plot thickens for Sakura and Co. as the venerable Cardcaptor Sakura series marches on. As in the previous disc, the series has been injected with some much needed life. In episode 40, "Sakura and the Sakura from the Dream", the Dream card shows each of the cast what they each want most. For Sakura, it's a fortune and a dream-Sakura telling her everything will be okay. Sakura also realizes the woman in her recurring dream is her teacher, Ms. Mizuki. In Episode 41, "Sakura, Li, and the Sea of Sand", and 42, "Sakura and the Blacked Out School Arts Festival", cast Sakura and Li in a school production of "Sleeping Beauty". However, the tables are turned when Sakura is cast as the prince and Li as the Sleeping Beauty. In 41, while the duo practice their roles, they're attacked by the Sand card. In 42, during the play itself, the Light and Dark cards warn Sakura about the coming of Yue the Judge. Finally, in episode 43, Meilin is forced to leave Li, Sakura, and Tomoyo and return to Hong Kong. Things are certainly getting more CLAMP-ish for Sakura and friends. On this and the previous disc, Card Captor Sakura is beginning to outgrow its magical girl roots and become the bizarre magic/sorcery style show CLAMP is known for (along the lines of X or Mizuki-chan in Wonderland). Certainly, some fans of the first season will not like the change in attitude that is slowly taking ahold of the series. However, most fans will enjoy the change, as the magical girl formula was quickly becoming stale. There is an air of tension in these episodes as well, one that is not present earlier in the series. Sakura gets closer to uncovering the mystery of her dream, Kero is obviously troubled, and the appearance of Yue the Judge is mentioned a couple of times. The animation is as solid, as always. The colors are bright and the character design is well done. The animation is smooth (for a television series) and overall the visuals meet expectations pretty well. The sound is also standard; I didn't hear any audio dropouts on either season two discs. Additionally, this disc features the new opening and closing visuals and music (the opening with "Dreaming" and the ending with "Honey."). The disc's major bonus feature is a creditless closing version of "Honey." The disc also contains some production character sketches. All in all, it's what one would expect for the DVD release of a long running TV series. Again, I really see two types of fans interested in this disc; the first is, of course, those who have been keeping up with the series. The second group are those CSS fans that have watched several episodes, but haven't been keeping up with the discs since much of season one is re-treading old ground. For them, it's time to get back into the mix.